One of MasterCraft's most prolific brands is the Big Red Hand Blower. The Big Red Hand Blower is a sturdy and versatile hand blower designed for commercial use. The B650 Big Red Commercial Hand Blower has the ability and power to completely fill commercial river rafts to capacity. At the same time, the Big Red Hand Blower can also be used to fill balloons for a birthday party. 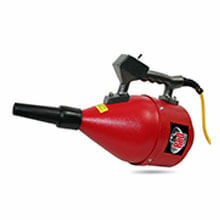 The Big Red Hand Blower is perfect for plants, factories, schools and even at home as a household blower or dryer.